Nursing and Business minded students in Central Florida now have the option to earn an affordable Bachelor’s Degree. On July 17th, 2017 the State Board of Education approved the following two bachelor degree programs; BAS in Supervision and Management and a BS in Nursing to be offered across four Central Florida State colleges, allowing them to provide affordable degrees with great employment opportunities and expanding horizons. The four colleges; Valencia College, Seminole State College, Lake Sumter State College, and Eastern Florida State College worked collaboratively with Orlando Health, Florida Hospital, and the University of Central Florida (UCF) to develop a curriculum and a 4 year college experience that would have a total cost to the student of only $10,000 – This met Governor Rick Scott’s goal that Florida Colleges develop affordable 4 year curriculums. The introduction of the two degrees are targeted to begin in Spring 2018. Grennan Fender’s Sr. Vice President in Marketing and Strategic Consulting, Geoffrey Gallo, accompanied Valencia College leadership on the successful trip to the state capital. 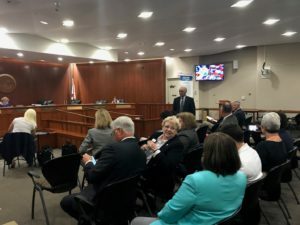 Gallo represented the Central Florida business community and advocated for the positive impact that the Supervision and Management program would have on privately owned businesses and their ever increasing need for qualified talent. Gallo is a leader of the CEO Leadership Forums, a group of 20 close-knit Professional Services firms, whose purpose is to deliver practical education to Florida Business Owners and deliver scholarships to deserving students of Valencia’s new 4 year business degree program. It is anticipated that 40 scholarships may be delivered to inaugural students of the new BAS Supervision and Management degree at Valencia. Some of these students may also qualify for part-time jobs made available through the interaction of business owners with students attending the college. According to Gallo “The new program not only opens a whole new window of affordability to potential students who could not otherwise afford a 4 year degree at other universities, but it also gives skilled technicians in the local workforce the ability to remain on the job while furthering an advanced education in business”. Currently there is a major shortage of qualified managers and supervisors with the necessary credentials to lead businesses through complex tasks, so this state approval should result in seeing some significant effects on the Central Florida community. It is a wonderful opportunity for bot the “up and coming” students and the area’s businesses alike. Inside the court room during the hearing. Grennan Fender Hess & Poparad, LLP is a full service accounting and assurance firm that provides a wide array of services to our clients, including tax, audit, consulting, and tax planning for both individuals and businesses. We know that the needs and demands of our clients are ever-changing and we pride ourselves on our ability to meet their needs by our continual educational training and technological development.